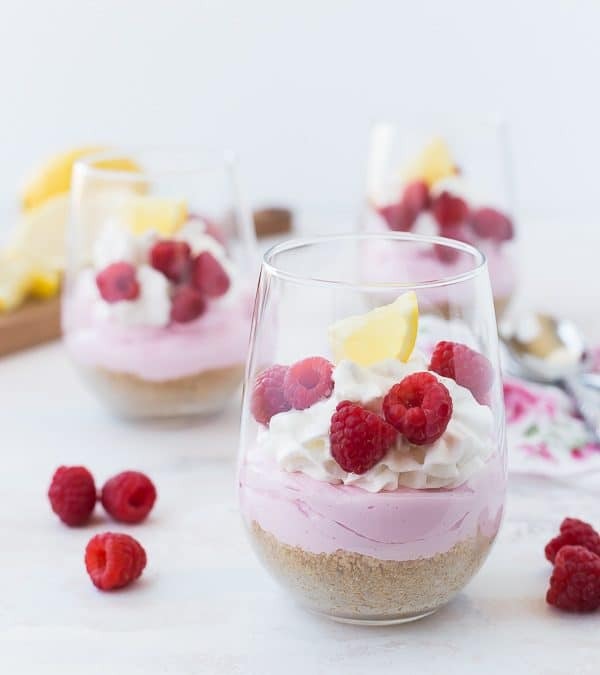 These fun No-Bake Mini Cheesecakes scream springtime with their pink lemonade flavor and sprinkle of fresh raspberries. They’re bright and cheerful and SO easy to make! You’re going to love them! Is anyone else itching for spring in a major way? I’m not looking forward to the return of my severe springtime allergies, but gimme all the sunshine and give it to me right away! Michigan has been kind enough to give us a couple little tastes of spring, but they’re always followed by the cold reminder that anything is fair game in the mitten state. I know Michigan isn’t unique in this weather-teasing game, so I’m sure there are many of you out there who are ready to trade in boots and parkas for some lighter gear. My recipes have also started to take on more spring-like qualities. My fridge is seeing more berries than oranges and more asparagus than hearty root vegetables. The produce might not be quite at its peak yet, but I’m stocking your recipe box so that you’ll be ready when the produce decides it is. I’ve partnered with Stevia In The Raw® to bring you this fun springtime dessert that’s pretty, sweet, and easy to make. 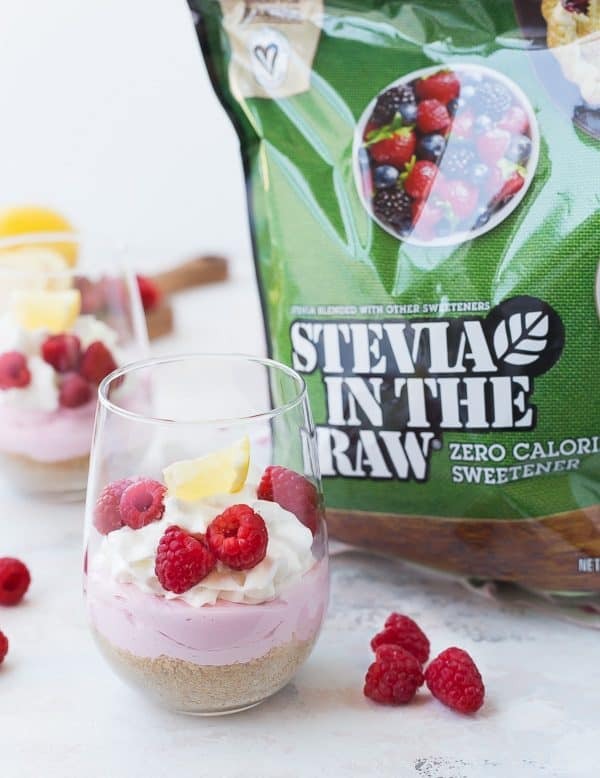 The addition of Stevia In The Raw® brings all the sweetness you’d expect in a dessert but with zero added calories. That’s great news because we all know what comes after spring. Spoiler alert: It’s not poofy parkas and scarves. Another bonus is that Stevia In The Raw® Bakers Bag measures cup for cup with sugar, so there aren’t any tricky conversions necessary. While this particular recipe is of the no-bake variety, it’s super simple to use Stevia In The Raw® in any baking recipe to reduce sugar and calories. My one tip is to only replace half of the sugar in the recipe to get the proper rising, browning and caramelization that only sugar can provide. 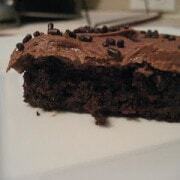 As with all my recipes, this one is ridiculously easy to make. You don’t have to worry about your cheesecake cracking in the oven, because it’s no-bake. You don’t have to worry about perfect slices coming out of the pan, because it’s pre-portioned in fun little glasses or bowls. You can make 90% of this ahead of time, leaving you more time to mingle with friends and family. And of course, I’ll cover some fun variations of this recipe to make it your own! First, find cute little bowls or glasses. 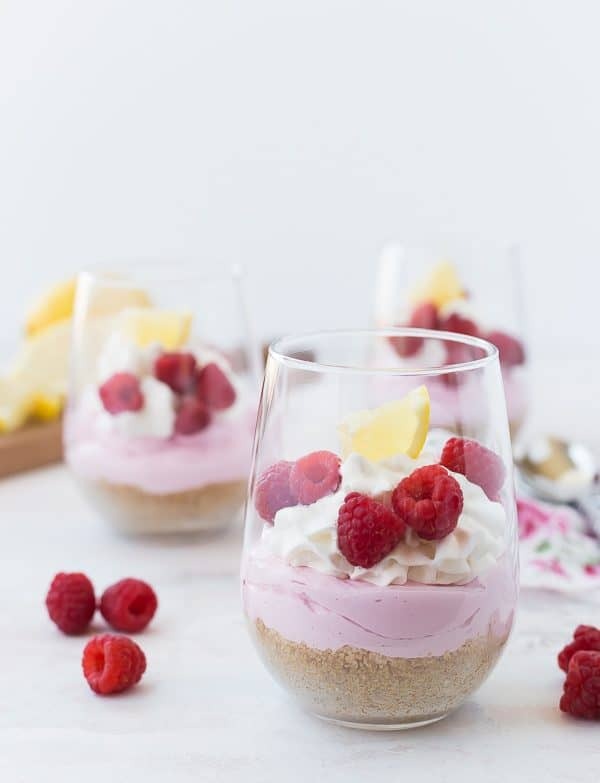 I used stemless wine glasses (which, truthfully, are a bit large for this dessert), but there are some fun choices online for disposable mini dessert cups that include cute little spoons! They’d be great for parties. Otherwise just grab whatever you might have in your cupboards. Next, make your graham cracker crust. I use a food processor to quickly turn my graham crackers into crumbs but you can also buy them already in crumb form, or you can use a zip-top bag and a rolling pin and get out a little aggression! Once you have crumbs, mix with melted butter and Stevia In The Raw®. You’ll pat this crust into an even layer on the bottom of the cups/glasses. Next, the filling! 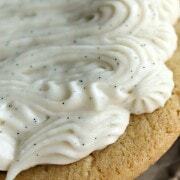 Use a hand mixer to get some cream cheese nice and fluffy before adding heavy whipping cream to make it even fluffier. This gets flavored with lemon juice and zest and sweetened with Stevia In The Raw®. Beat until super fluffy and add to the top of the graham cracker crust! I like to use a piping bag for this but if you’re skilled with a spoon, go for it! This is where you pop them in the fridge if you’re not serving the right away. Garnish right before serving. I like whipped cream, fresh raspberries and a little wedge of lemon. However, Ben thought the lemon was pineapple and took a big bite of it, so ummm….warn people, maybe? 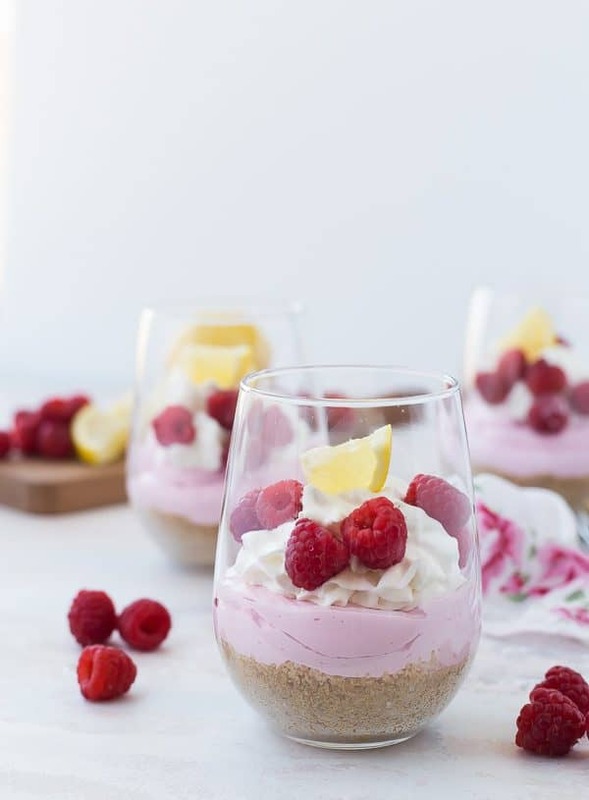 Add a sweet and flavorful layer with raspberry jam or preserves like these lemon berry cheesecakes. Make them bigger or smaller – this all depends on what size bowl or glass you have. They look fun in shot glasses for a tiny taste. My bowls (glasses) are on the huge side, I’d recommend something smaller if you want five servings to look presentable. Love crust? Me too! The first time I tested these (as photographed), I found them to be a little heavy on the crust (I love it that way, but it wasn’t the perfect ratio). I cut the crust recipe in half, leaving the cheesecake the same. BUT if you love crust, double it up! If you love the cheesecake layer more, double up on that! 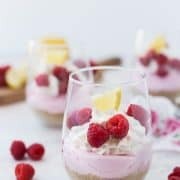 Try making these as parfaits! Add crust, then cheesecake filling, then berries, and then repeat crust-cheesecake-berries for a pretty parfait appearance. It also makes it easier to get a bite of everything in each spoonful. 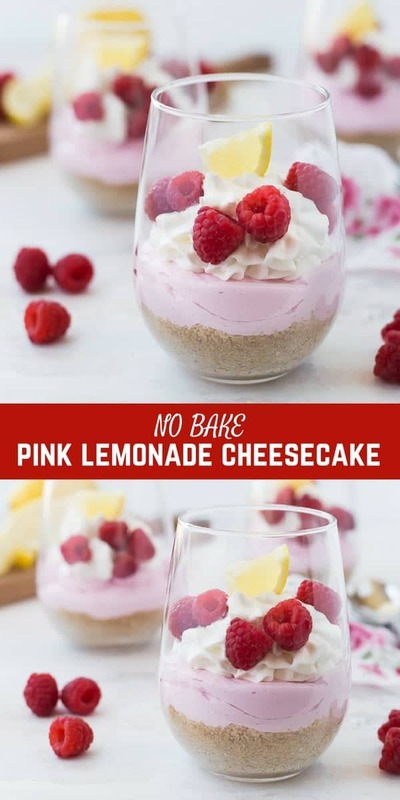 I love the pink lemonade cheesecake mixture for these No-Bake Mini Cheesecakes paired with raspberries, but it would be great with any berry or any combination of berries. Ideas: Strawberries, blackberries, blueberries. 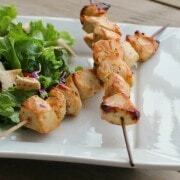 Head to InTheRaw.com to learn more and get more recipes! In a food processor (see notes), pulse graham crackers until they are fine crumbs with no large pieces remaining. Once you have crumbs, mix with melted butter and Stevia In The Raw® until combined. Divide graham cracker crumb mixture evenly between serving vessels. Pat down gently to form crust. In a large bowl, use an electric or stand mixer fitted with the whisk attachment to whip the cream cheese until it is smooth and creamy. Add cream, Stevia In The Raw®, lemon juice, lemon zest and pink food coloring. Mix on low until combined and then increase speed to medium-high and continue to mix until it is light and fluffy. Add a layer of the cream cheese mixture to each dish. (I used a piping bag to make it a little neater). Chill for at least an hour or until ready to serve. Serve topped with whipped cream and fresh berries if desired. Nutrition information does not include additional whipped cream on top. If you don’t want to dirty your food processor, buy graham cracker crumbs OR put then in a zip-top bag and smash with a rolling pin or meat tenderizer. It takes a bit longer, but it’s kinda fun! Verdict: These no-bake mini cheesecakes are so good! 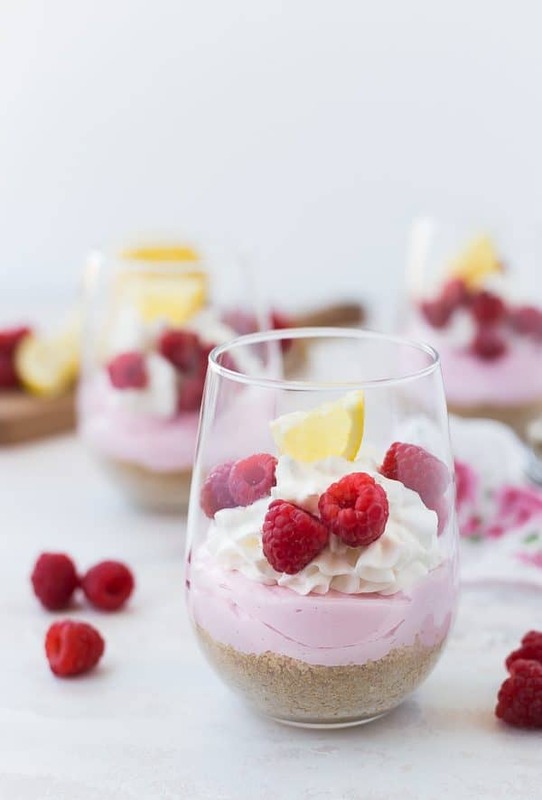 I love the tartness of the lemon paired with the sweet berries and sweetness from the Stevia In The Raw®. Husband’s take: Ben loved this dessert, too! Changes I would make: None are necessary but if you want to have some fun with it, try my suggestions I wrote about above. This content and recipe is in partnership with Stevia In The Raw®. I was compensated for my time and work but all opinions are, as always, my own. Thank you for supporting Rachel Cooks by reading about brands we use and love in our own home. Sponsored posts like these help me cover some of the expenses involved with keeping this site free for you to use. I love a no bake dessert! So cute how you put them in a glass!